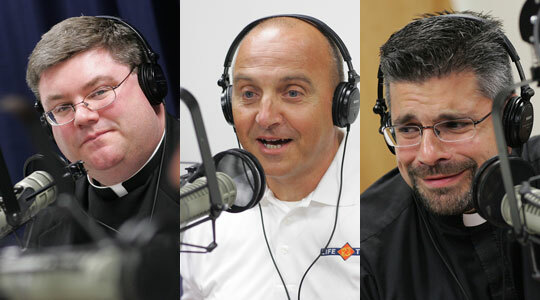 Summary of today’s show: Randy Raus and Fr. Matt Williams join Scot and Fr. Chris O’Connor to talk about the LifeTeen ministry; its focus on the Eucharist; its effects on teens, including generating many priestly vocations; how it brings families together in the parish; and how they are helping teens prepare for the new translation of the Roman Missal coming this Advent. 1st segment: Scot welcomed Fr. Chris back to the show. He noted Fr. Matt Williams is also on the show as a guest. He said Randy Raus from Lifeteen is in Boston to speak at the Lift Ministries even tonight. Randy said Lifeteen is parish-based youth ministry in 1800 Catholic parishes in 26 countries. Most are in the US. It is Eucharist-centered with a devotion to the Blessed Mother. They lead teens to Christ through a celebration of the liturgy with music and homily geared to young people. After the Mass are Life Nights, catechetical nights. It’s a large group setting that takes them out of the classroom setting to interact with their peers to talk about their faith and experience it in prayer. Randy was a parish youth ministry in Marietta, Georgia. He started with 15 kids in his youth group and had built it up to 80 young people when a teen asked him about LifeTeen. The teen said his old parish in Arizona did LifeTeen and the kids in his old parish made Mass the top priority. He realized that they needed to do more to lead teens to Christ in the Mass. The teen kept bugging him until he went on a training conference for LifeTeen and kicked off the ministry with about 300 teens eight months later. It transformed the parish. Fr. Chris asked how the Eucharist and Mary play the primary roles in LifeTeen. Randy said we are seeking to fill the God-shaped hole in our lives. Whatever a teen is facing in their lives, bring them to the Eucharist. That’s the centrality of our faith and of LifeTeen. It helps them to focus on Christ and helps them understand the Real Presence in the Eucharist. Once they realize that fact, it changes everything. Allowing the Blessed Mother to intercede for them and lead them to her Son, she points them only to her Son. Scot asked what specific things do they do to make the Real Presence real for them. The key is for the adult leaders, Core members, have to be having encounters with Christ themselves and believing it. It’s a contagious environment. You give them space to experience Christ. Fr. Matt’s first assignment as a priest was with St. Mary in Dedham which has a LifeTeen ministry. When he first arrived at the parish, the pastor talked to him at length about LifeTeen before anything else. The kids were excited to meet him as their new priest and couldn’t wait to meet him. He felt ill equipped at the time, but the kids had a simple witness that led him to go deeper. The joy of his week was celebrating that Mass every week with the kids and their families. Randy said young people bringing their families back to the Church are an unplanned benefit to the ministry. There is a part of LifeTeen now that is called ParentLife. They even see teens bringing their parents on retreat and leading them to Eucharistic adoration. Fr. Matt said he can imagine asking where are all these kids and how do we get them in our church? What is it that gets them in the doors? Randy said young people are relational, so they need someone to look them in the eye and welcome them to Mass. The average young person needs to be asked five or six times. Scot asked if peers or adults are better askers, but Randy said it just has to be somebody authentic and real, who cares enough. Today teens are easier to approach than ever before and open to adults talking to them. Teens do care that their peers are going to be there, but a genuine invite goes a long way. Even before they get in the door, there has to be a sense of hospitality. People greet them at the door, hand them a song sheet, welcome them in. The music uses instruments teens are used to hearing without taking away from the reverence of Mass and done in a quality way so they will sing along. Scot said you hear a lot that Mass is boring. But there’s an energy in LifeTeen. How do they get from the former to the latter to appreciate what the Mass really is. Randy said Mass can be a great catechetical experience explaining what’s happening. But the LifeNights include specific topics that break open the parts of the liturgy. Also, by going away on retreat or big conference, they experience it in a different way that puts them on fire for being engaged in the liturgy. It’s part catechetical and part experiential. Fr. Matt said if everyone else is praying and you’re not, then you’re the one who stands out. If the community is formed and worshipping, then it encourages others to join in. 2nd segment: Randy said in his parish they had a 6pm liturgy on Sundays. It was the last chance Mass. They took a Mass of 45 minutes to one that was 1-1/2 hours. Attendance doubled and became standing-room only. It wasn’t that people were interested in Mass, but they didn’t feel a part of it. And a community developed around it, not just among youth. This happens in parishes around the world. Scot asked how it affects the other Masses of the weekend. Randy said over time people would end up going to that Mass instead of others. It became the most popular and, by the way, had the highest collection. It affected the whole family with families going together and they would schedule their Sundays around this Mass. Fr. Chris said as he interviews young men looking to enter seminary he finds that most of the young men have some connection to LifeTeen and/or Steubenville. Randy said there is a positive interaction in LifeTeen between priests and young people and the young people see priests in a positive light. They also talk to teens about considering vocations in prayer before the Blessed Sacrament. The USCCB last year contacted LifeTeen and said they were a major source of vocations within the Church. The USCCB worked with LifeTeen to create a website of parish-based resources. They then surveyed seminarians and found that 49% had attended something connected to lifeTeen and 30% said lifeTeen was the determinant for entering seminary. LifeTeen’s goal is to serve the Church however they can. To implement LifeTeen, it takes the support of the pastor. They need someone dedicated to be a youth minister, volunteer or paid. They need a core team of adults trained to do youth ministry, putting on the LifeNights. They need musicians to learn the music and put on a vibrant liturgy. It’s a lot of work, but their experience is that it has an impact on young people and transforms their lives. He said the minimum size of the core team would be five people for a small parish, but ideally you want 10 ore more. You can start with less and add more. Some parishes start with 15 teams and one year later have 75 active teens. The Mass is a community Mass, not just a teen Mass, and it’s every Sunday. Of the four weeks of the months they have two catechetical nights, one on an issue and one social night. Scot asked Fr. Matt about his experience celebrating LifeTeen Mass after celebrating more traditional forms of Mass. He said at St. Mary’s he had many different kinds of experience: children’s choir, adult choir, and LifeTeen. Everyone has a preferred way of worshipping that speaks to them most. For him, he enjoys Christian contemporary music. To have youth and their parents who want to be there and praise God is amazing. There’s something about the gift of their youthfulness that lift up the community and has a powerful effect on the whole congregation. Fr. Chris added that LifeTeen is strictly in line with all the General Instructions of the Roman Missal and there’s nothing out of the norm. It is line with all of the rubrics. Randy said LifeTeen is obedient to the bishops and all of the liturgical guidelines. They work with the liturgists in the diocese. Randy said they lost four teens from LifeTeen in the Columbine shooting and Archbishop Chaput celebrated the LifeTeen Mass with the parish after the shooting. It wss the most healing experience Randy has ever had. Fr. Chris asked how LifeTeen prepares youth to transition to a more traditional parish Mass as they move on in life to college and beyond. Randy said campus chaplains love to receive LifeTeen students because they are active and involved in ministry. Randy said it’s LifeTeen’s job to be open to help them be open to all expressions of liturgy and not base their faith on the music at Mass. While music draws teens into the experience, it’s youth ministers’ role to help them develop that experience of the Eucharist to carry on to the rest of their life. 3rd segment: Scot asked Randy how LifeTeen is helping teens approach the significant changes in the prayers of Mass that are coming this Advent. Randy said they need to feel like they’re ahead of the curve and providing resources to the parishes. They created a resource called “Word for Word,” a DVD and workbook that helps explain both at Mass and at Life Nights. Randy said Bishop Ron Herzog of Alexandria ordered copies for every parish to show. The videos are geared for both high school and middle school. Randy said he thinks it will help teens focus more on the liturgy and be a growth opportunity for the whole Church if we don’t focus on the negative of change. Fr. Chris said Eucharist adoration plays an important part of LifeTeen. Randy said it is important, but they never make it more important than Mass. They’re seeing even middle school students at their camps spending 30 minutes in silent adoration. He had one camper tell him that he feels God is asking him to be a priest because in adoration he finds himself thinking as a priest, not just a teen. He found himself thinking about all the others and hoping they see Christ in the Eucharist as well. LifeTeen is setting a norm. This is the new normal, expecting young people to encounter Christ in this way. Scot asked Randy about Life Nights. Randy said Life Nights are taught from a single person which is different from most religious ed because they have multiple teachers so the message is better controlled. They use the form of the Mass to gather, proclaim, break it open, and send forth. They set an environment for the night. They want the room to be set up specifically for the theme of the night to let teens know that this will be something different from the last time they were. There might be a video to watch or a game that engages them in the night. In the proclamation, they have someone talking, usually with notes provided to them by LifeTeen in language the teens can understand. Scot asked how bigger events outside the parish, like pilgrimages, integrate with parish youth ministry and how important they are. Randy said World Youth Day has some of the biggest impact on teens that they will have in their life. They are parish-based so they have teens come as parish groups to events. LifeTeen will once again be having at the invitation of the Vatican to have a special LifeTeen experience on one of the nights of World Youth Day in Madrid, Spain, in August. They encourage parishes to be active in diocesan youth rallies and they also offer programs for parishes to send teens to. Randy said he is passionate about youth ministry. He can’t think of a more important ministry. Studies show that if teens are not active Catholics by the end of high school they don’t have a high chance of being active Catholics of adults. He is the father of eight and it’s had an enormous impact on his family. His brother was diagnosed with liver cancer and after the diagnosis two of his children approached him on their own and told him that he needed to receive the Eucharist and become Catholic. The week before surgery he converted to Catholicism. He has since died, but he had already developed a relationship with Christ in the Mass and with the Blessed Mother. Fr. Matt has been struck by watching the development of core team members as they become confident in their faith and then seeing young people become triggered in their faith. One of the young people in Fr. Matt’s office, Danielle, is the fruit of LifeTeen at St. Mary’s. A seminarian from St. Mary’s is also the fruit of LifeTeen. He said the culture of the world is strong and we need to building up our college ministry to continue the strong work of parish high school ministry. When they come back they can then find a community of alumni. Tonight, Randy Raus will be speaking at Lift about Bl. John Paul II and his call to proclaim so many people as saints. It’s not something reserved for the elite, but is something we should all be setting that as our goal. Lift is a monthly gathering on a Tuesday night, 7-9 pm at Fontbonne Academy in Milton. It starts with music by Jon Niven and his band, then a speaker who teaches on the faith, then Eucharistic adoration with time of quiet prayer, led prayer, and some songs, followed by Benediction, more songs, and fellowship after. It is intergenerational and all ages go.